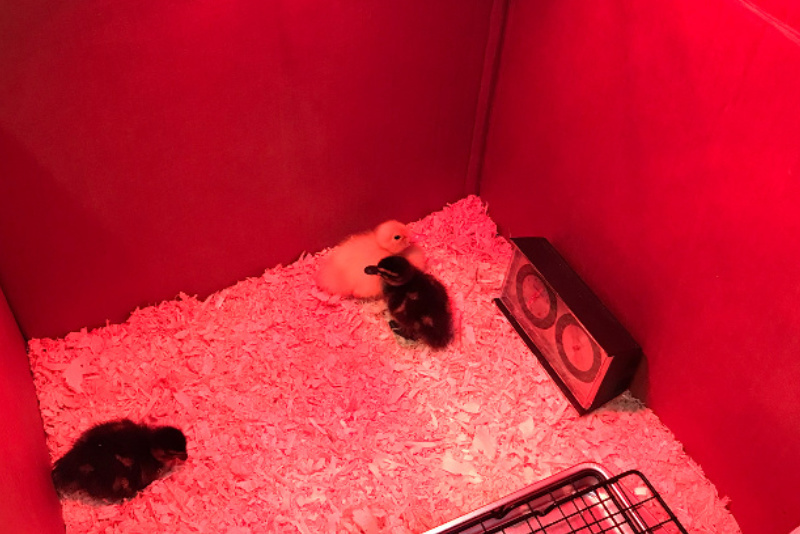 If you are getting ready to bring home your very first batch of baby chicks, this baby chick supply list will help you get ready before you bring them all home. One of the most rewarding things about being a backyard homesteader is farm fresh eggs every single day. I cannot tell you the satisfaction I get when I am cooking food that I have grown or raised on our little homestead. The love and care that goes into this food make all the work and care that goes on behind the scenes worth it. One of the most exciting times of the year for me is when we order our supply of baby chicks. I like to order mine through the mail, I know right? But I have been ordering my chicks this way for 8+ years and have not had any significant problems, even in the dead of winter my little babies arrive safe, sound and toastie warm. If you are ready to dive into the fun and enjoyable world of backyard chickens then you’ve come to the right place. 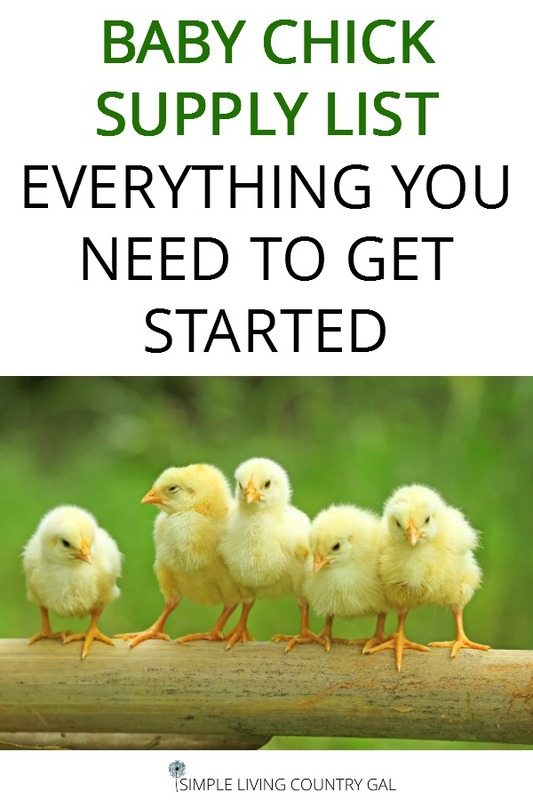 And even though adding livestock to your homestead might seem overwhelming, my goal is to lay it all out for you in a simple easy to follow way. So you can read, do, and begin your journey to farm fresh eggs for your home today. Do your research, make a supply list, get it bought AND set into place before your new chicks come home. This will give your baby chicks an amazingly good start along with less stress for them and you. This one is pretty easy and doesn’t require any money. I recommend using a heavy duty cardboard box. You want a box with high sides to keep your little chicks from hopping out. You also want the sides low enough so you can easily reach in to feed, water, and touch your little birds. To find a good box, you can visit a local appliance store or ask right on Facebook. You might be surprised how many of your friends have a box that will work perfectly to house your little chicks. Chicks require ½ square foot of space to start out, so you may need more than one box depending on how many birds you get. I also like to put a “lid” on my chick pen. You can use an old window screen or a small section of chicken wire. The goal is to keep the chicks in but also to keep danger out. A family pet or curious little hands can accidentally harm or stress out your chicks. Keep them secluded while they are growing to give them the best possible start. Just make sure whatever you use will allow for air flow and ventilation. Ninja tip: Baby chicks create an INSANE amount of dust. So keep them in a place where this will not drive you crazy. A basement is a good idea or a garage if the temps are warmer and you do not have pets that can harm them. I have kept mine in the mudroom but the daily dusting drove me a bit crazy. So now I keep them in the basement and only dust when I move them out. If you decide to use a plastic tote to keep your chicks in, please use caution. 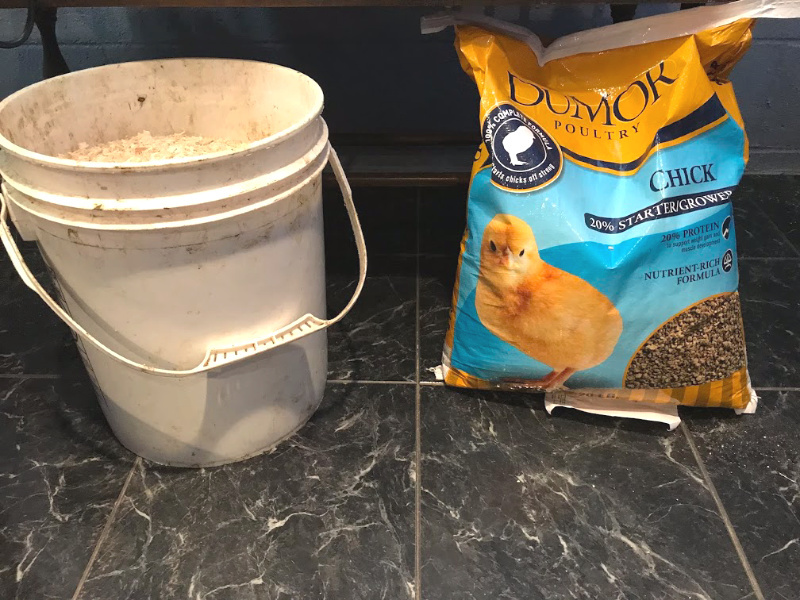 Keeping your chicks on a slippery surface can cause curly toe so if you choose a tote, make sure to have a thick layer of bedding down on top of a few sheets of newspaper. This will give your chicks better grip for their feet. Read: Curly toe. What is it and how to prevent it. 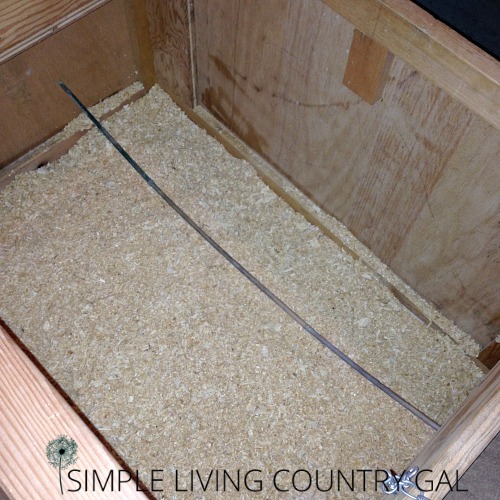 I have found that poultry bedding or wood shavings, work the best to keep things clean. Depending on how many chicks you have will determine how much bedding to put down. About an inch seems to work well. Baby chicks pooh a lot, so you will need to tidy things up once or twice a day. To clean, simply remove any soiled areas and replace with fresh shavings as needed. Chicks need heat especially when they are brand new since they do not have the warmth of their mothers to do this for them. It is recommended that the temperature of your chick’s brooder stay between 90-95 degrees for at least the first week. You can then begin decreasing the temp by 5 degrees each week from there. This will acclimate them better to the outside temperature where you live. To keep things toasty I recommend purchasing a heat lamp and heat bulb. 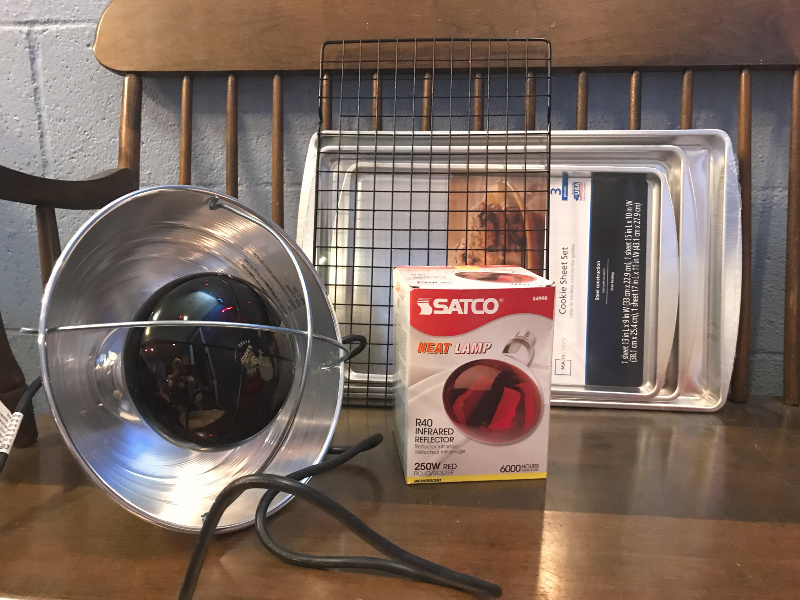 This is the same heat lamp that I use and the clamp is a safety feature you will want to have along with the metal guard. You can find heat lamps and heat bulbs (they are sold separately) at Amazon, Tractor Supply or any feed mill. Disclaimer: Heat lamps are a fire hazard so make sure you purchase one with a guard like the one shown here. Also, use every precaution to ensure your lamp will not come in contact with paper or the chicks themselves. They are HOT and will do damage quite quickly. Make sure the clamp is secured in a way that it cannot be jiggled loose. I also have a small thermometer that I can use to check the temp, it is important to keep a consistent temp on your peeps. Next on our chick supply list is water. As with any animal, it is important to give them fresh water at all times. Baby chicks are active little things and can make a mess pretty quickly. Besides housing, fresh water is the number one way to ensure your chicks are healthy. Because of this, you may find yourself changing your chick’s water several times throughout the day. I suggest having a small waterer to make that job a bit easier. I usually change the water completely out in the morning and again at night. This waterer is really inexpensive, less than $3 but shipping time is a bit long so please keep that in mind if you choose to purchase it. Ninja tip: To get your brand new chicks to drink water, as you are putting them into their new home gently dip their beaks into the water and set them down. This is usually enough to tell them there is water close by and put them in “search” mode. If you find a chick is not able to locate the water the other chicks will usually lead by example, but you can always dip their beaks again. I feed my chicks a starter feed that contains everything a new chick needs nutritionally. I suggest keeping your chicks on this feed for the first 8-10 weeks. 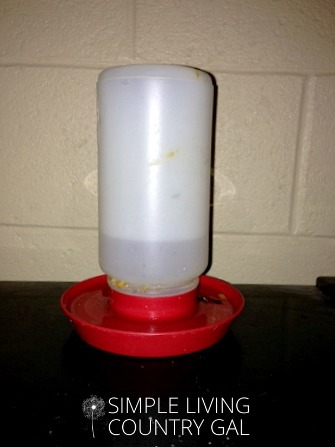 You will also need a feeder that will dispense feed continuously throughout the day. This is known as a self-feeder and you can find one at Amazon for pretty cheap as well like this one. Just like with the water you will need to check the feed often to remove any bedding or poo. 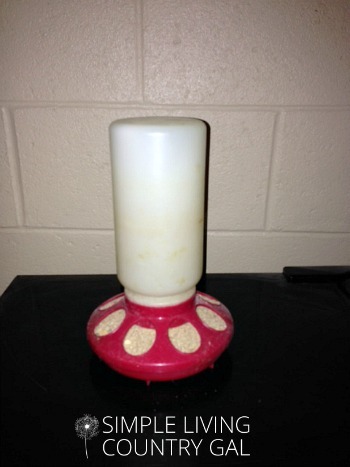 Just pick the debris off and jiggle the feeder to get more food to the bottom. Fill the feeder as needed. Another item on our chick supply list is a roost. For some reason, I think the chicks must get bored in that box all day long so by providing a roost they at least have something to do. It’s funny watching them hop up, hop down, only to hop back up again. 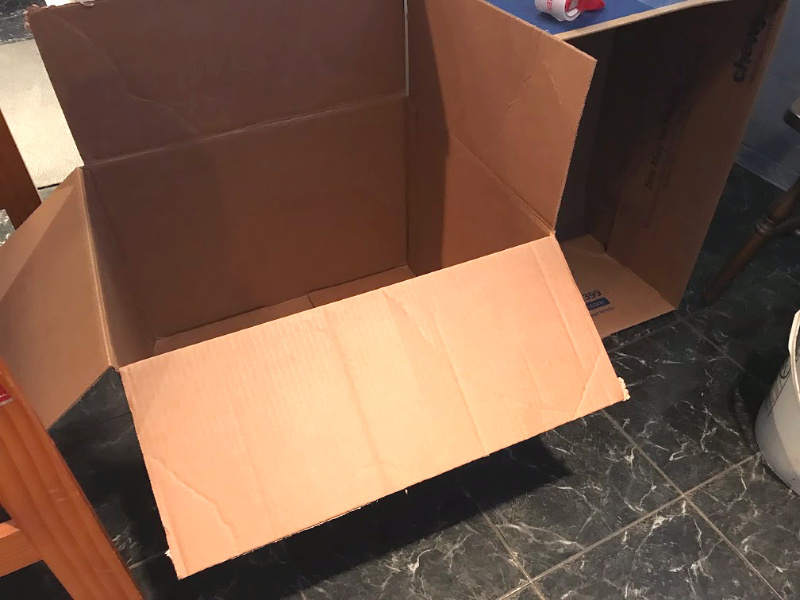 If you have a cardboard box, you can just poke a small hole at each end of a corner. If you are using a wooden box, you can just wedge it in. And there you have it. Easy peasy! 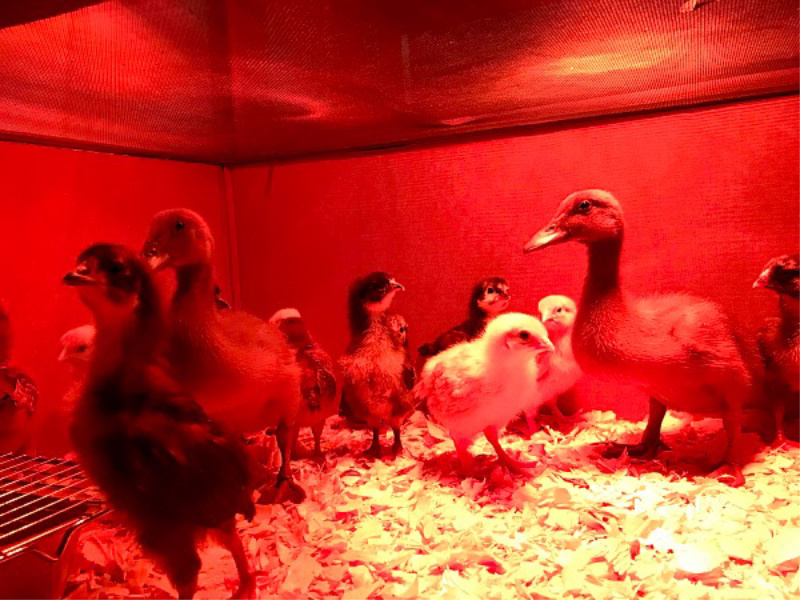 Baby chicks are such a fun and easy way to get your start in homesteading. Low startup costs, small housing, and easy maintenance are just a few of the perks not to mention all the fun you will have watching your little peeps grow! « How to Build a Chicken Run to Keep Your Chickens Safe From Predators. How big around of a roost do you use for them? Like, about a finger thick? I don’t want too small or big to start off with and I have never had chicks before! I appreciate this post SO much! I have my list and I am getting supplies ready!! I am so excited you are getting chicks! How fun for you. Chickens are not like wild birds, they do not require a small roost board or rod to wrap their feet around. They actually like it better when they are flat-footed. So a board that is at least 2 inches wide to about 4 inches wide will work just fine.